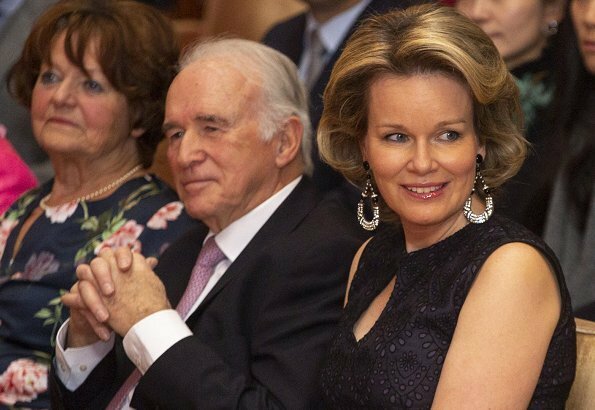 On January 26, 2019, Queen Mathilde of Belgium attended a concert at Brussels Place Flagey, given in honour of Baron Arie Van Lysebeth who was the President of the Jury of the Queen Elisabeth International Competition for 23 years from 1996 to 2018. 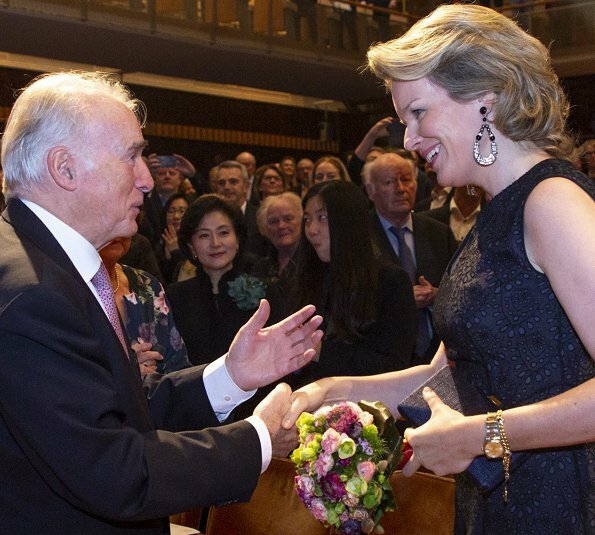 The concert was organized by The Queen Elisabeth International Competition. Yes, I think her hair is gorgeous here. 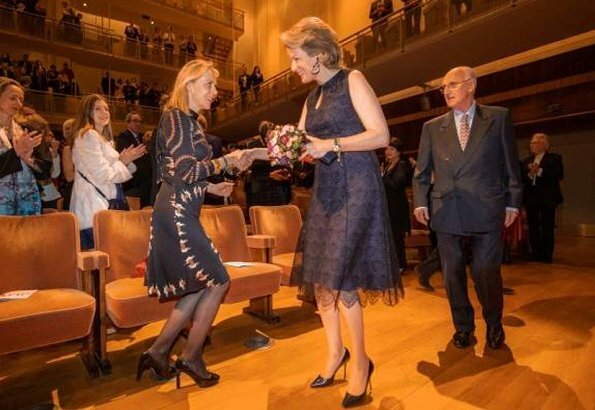 Queen Matilde looks fabulous! Love her hair style! What a gorgeous queen in a gorgeous dress! wat een knappe Koningin hebben wij, en dit is ook een mooi kleedje. I think with longer and fuller hair as she is here she looks very young. Beautiful dress and the Queen looks very well, glowing! I don't care for the earrings, they look cheap though Im sure they aren't. if I remember well, one of her sisters is a jewelry designer. Lovely dress and I can live with the costume jewellery earrings but I don't like her hair. I rarely do - I find it matronly and aging, she could get a part in Dallas with that bouffant style. Franny, hahaha, I was just thinking the same, she is sporting " big hair" , it definitely ages her. Love the dress, and the waist is at the right height, I don't dislike the earrings, but I think it's an overkill and they distract from the outfit, however she looks radiant!! Royalty Fan , I don't " want" her on any hair that she wouldn't like herself, this is a fashion blog and as such one gives her opinion, and I repeat , this hairstyle in my humble opinion is very dated, not even my grandmother wears a bouffant any longer, it is dated and ages her, and that is not to say that it's badly executed, it's a choice of hers, and obviously some people like it. If she chooses to wear a dress from the seventies we would also say that it may be pretty but dated. Looking at at the royal ladies it would be hard to find one sporting such hairstyle, unless of course they are of certain age. Was für ein Glück der König hat ! !